Africans must realize that the history we study in school is a European version of African history. Why? Because the Europeans after conquering the rest of the world and colonizing so many nations, installed their language, education, religion, in all conquered colonies, and in the process also installed their point of view about accounts of events (history), so the history we are taught is simply European account, not our account. If we colonized Europeans, history would've been different, it would've been to elevate ourselves. Look, the account they gave us is not a true historical account because history is written from the view point of the writer. In fact, history is written by the victors, not the vanquished. If I conquer you, if I enslave you, if I colonize you, I'll write your history to favor me and I'll force you to study it in order to make you ashamed of yourself. If I make you ashamed of yourself, your history and your culture, I'll subdue you and rule over you because you'll then worship me. That's exactly what the Europeans did. 1. Take the history of the conquered. 3. Control their psychology, i.e take away their values, interests, religion, and principles. They take your history and superimpose theirs on it. They take your language and superimpose theirs on it. They take your values and priorities and superimpose theirs on it. Once this is done, no matter what decision you make, you will always end up serving the interest of the oppressor’’. Once you have been subdued, you'll then teach your children the same version of history written by the conqueror, and your children would do the same, your children's children would do the same, and their children would do the same, and so on. As you can imagine, your nation is subdued forever and would never be able to rise above the conqueror!. Dr. John Henrik Clarke, puts it in another way when he said ''to control a people, you must first control what they think about themselves and how they regard their history and culture. And when your conqueror makes you ashamed of your culture and your history, he needs no prison walls and no chains to hold you''. The reason the conquerors write history is to use it to subdue the conquered. If I conquer you and write your history, telling you that your ancestors were nobody and that they achieved nothing, you won't have the moral to challenge my rulership over you because you would think I came to save you. This is the lie that has subdued us in Africa for many years. We have accepted the lies by and today most of us have no idea that we had schools and universities in Africa before Europe. Most of us don't know that the first humans to inhabit planet earth were Africans, and that we have been in this world living happily alone for thousands of years before the emergence of any other race. Most of us have no idea that the wealthiest man ever lived on earth was an African. Most of us don't know that we Africans invented gold and that we are the ones who made it a precious metal. Most of us don't know that Judaism, Christianity, Islam, evolved from ancient traditional African religions that spread to the Middle East. Most of us don't know that writing and literature were invented here in Africa when Europeans were living in caves. This article is to guide you on how you can begin to learn the true history of Africa and African contribution to world civilization. Over many years of my studying black history, I have come across scholars that Africans need to know if you want to set yourself free from European indoctrination. 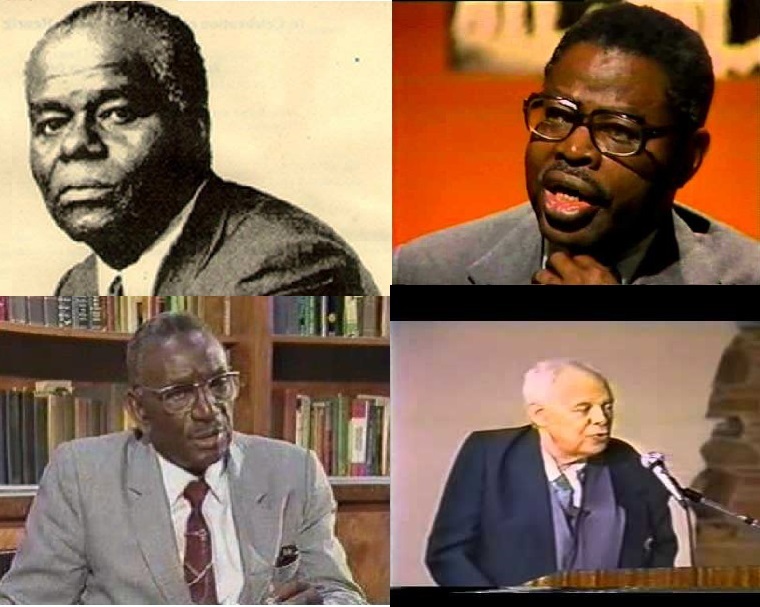 Below are exceptional Africans and African-American scholars of history that black people should know. These brothers will show you how Europeans doctored African history and deleted anything suggesting black power. It is arranged in no particular order. A great teacher of African history. The name of this man is history. Check out his lectures on Youtube if you want to know general black history/African history. He would go from West Africa to South Africa to ancient Egypt to Europe to America. He is everywhere!. Check him out if you want to know African contribution to science. Black history/black science, ancient inventions. This brother is the best if you want to know how Christianity was practiced in Africa thousands of years when Europe didn’t even exist. Watch his lectures on Youtube if you want to know how all religions originated from Africa. His books include; the African origins of the major western religions, the black man of the Nile. Learn from this brother if you want to know the origin of mankind and how Africans were the first to invent the concept of government, religion, education. On religion, he’ll show you historically that many saviors died and resurrected here in Africa before Jesus. Of course, we didn’t call it Christianity at that time. It was spirituality, a way of life. His books include; Christianity before Christ, Introduction to African civilization, and Man, God, and Civilization. Great ancient African/Egypt scholar. African-Americans first began to challenge European version of African history. But Diop was the first African to challenge European version of African history. Teacher of Ancient African philosophy/Egypt. His books include; African philosophy the pharaonic period. Teacher of ancient African religion and how it evolved to other religions. Teacher of ancient African spirituality with proofs written on stone on how Europeans plagiarized ancient African spirituality to create Christianity. He organizes tours for those who want to visit Kemet (ancient Egypt, Sudan, Ethiopia). An educationist to the core. Teacher of history of mankind and how Africa set the pace for the rest of humanity. How education, science, spirituality originated from Africa to the world. Teacher of lost ancient African knowledge. The truth about Christianity. Ancient African philosophy and metaphysics. You can enroll in an e-school. Non-religious view of the bible and Christianity from the perspective of history. He teaches how Christianity originated in Africa. He probably attended a bible school and he believed Jesus was a real person but wasn’t anything more than any other human being. His books and lectures would be good for those of you who still want to cling to the belief that Jesus must have at least existed, even if he’s not the son of God. In my opinion, if you’re interested in the truth, the truth is that there was no Jesus. However, his books include; African origin of the Christian Church. A former pastor who later discovered Jesus is fake. He is the bomb when it comes to showing Christianity as a fraud. He now runs a church where he teaches ancient African centered spirituality, not European Christianity. Check him out if you are interested in the truth about Christianity. Are you stuck with Christianity and want to know the truth? Go to youtube and search for him to watch his lectures. One of the first people to begin questioning the European version of African history. Kwame Nkrumah and Nnamdi Azikiwe learned from this man while they were in the USA. Once Nkrumah and Azikiwe learned that the Europeans were lying about African history, they became conscious and would then return to over-throw colonialism. I couldn’t find his lectures on YouTube as he died a long time ago before the video age. Kaba Hiawatha Kamene has written about him though. Below is a list of books recommended by the above scholars that black people should read if you want to know the truth about the world we live in. Some of the books were written by white people who stand for the truth. You need to know that there are white people who write the truth about African history, but they are regarded as radicals in Europe and their works don't get very popular. Those that I know the author, I'll say so, and those that I don't know the author, I'll leave it blank. To know more about any book, simply google it or check it on Amazon or other book stores and read the author's introduction. You can then decide whether you'll like to read it. African philosophy the pharaonic period............ by Prof. Theophile Obenga. The Christ Myth............ T. W. Doane. Bible Myths- ............Rev. Dr. Richard B. Westbrook. The Paganism in Our Christianity............ Sir Arthur Weigall. The Evolution of Christianity............ L. Gordon Rylands. A Short History of Christianity............ J. M. Robertson. Pagan and Christian Creeds............ Edward Carpenter. Christianity and Mythology............ Arthur Drews. Again, to know more about any book, simply google it or check it on Amazon or other book stores and read the author's introduction. You can then decide whether you'll like to read it. If you are the type that has enough internet access to view Youtube videos, the easy way is to go to Youtube.com and check out the listed scholars and their lectures. It is free!. Once you realize that Europeans have lied to you about history, your life will never be the same. Do you want to know the real reason Africa is poor and backward? This e-book is the philosophy and metaphysics of poverty in Africa. Download it for FREE. It concerns all the countries in the tropics that were colonized by Britain, France, Spain, Portugal. Africa will suddenly wake up and rule the world, any day we decode the message in this book, otherwise, get ready to be re-enslaved. There are 3 of such books that people should have written in Africa and in all the colonized countries in the tropics, but I have looked around and since nobody want to write about it, I decided to write one. 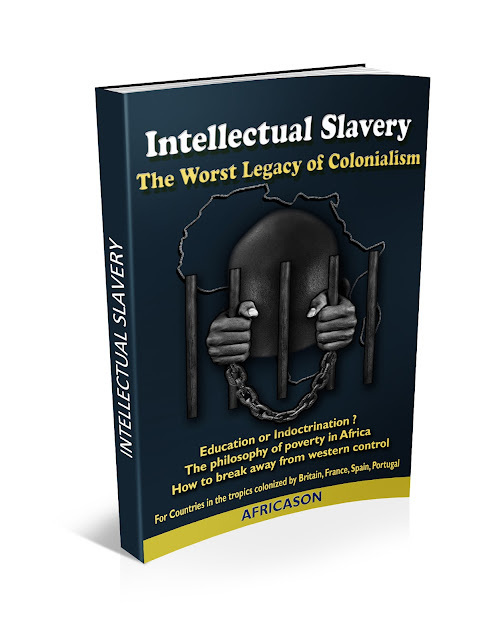 This first one is called intellectual slavery, the worst legacy of colonialism. The remaining two books dealing with other ways we are still being controlled and why history was distorted, I'll write later. The colonized nations in the tropics must realize the education we have is not originally ours, rather, it is one of such things imposed on our ancestors after our institutions were destroyed during colonialism, and it stuck with us ever since. Today, it seems natural. But, to accept it as natural means that we have eternally accepted our fate as slaves to knowledge, and indeed to worship the white man forever. This book will help you understand the true meaning of education, and also why we are poor. It will help you understand why European colonialists gave the wrong type of education to their colonies before independence, and also how the education is a tool for further external control. To be truly human with intellectual capability, would mean our changing what was imposed on our ancestors and charting our own course, different from what Europeans wanted us to be. There's nothing much to say here anymore, cause everything anybody needs to know about the nature of the education we have and how it would lead us back to slavery is all in this book. I have thought about it and come to the conclusion that I rather give out the book for free to all Africans to read than to make money. ''While others may have freed the body, none but ourselves can free the mind''............ Marcus Garvey. If you are an African who want to truly free your mind, and to understand our predicament in Africa, read this book. Its free!. Download the e-book free in PDF at either of the sites below. WARNING: This book will make you sad, but it will set you free. Can you handle the truth? Some of the things said in this book has never been said before, so I was caught us with inventing expressions and even words just to be able to explain certain things. Please take note of the below before reading. The contradictory or logical disharmony you get when using western ideals, values, philosophy, beliefs, etc., to question African ideals, values, philosophy, beliefs, etc.. vice-versa. This is the first stage of our problems in Africa, created by our unfortunate contact with Europeans. If you press the CTRL and ALT button and the DOWN ARROW button on your windows laptop or computer, you will literally have a philosophy mismatch when you try using the computer. PTWES is caused by prolonged philosophy mismatch, and it is a condition that any well educated African suffers for the rest of his/her life upon acquiring western education. PSPIRHS is the condition of often arriving at the wrong decision on how to solve a problem. The proffered solution often ends up as a misfit. The asaa principle of African consciousness is the use of the duality that exists in nature to give a panoramic answer to a question. It states that every question has two-in-one answer, just like the opposite side of a coin makes one coin. You must see both sides of the coin to fully understand how the coin looks like. An educated black man who is neither a white man nor a black man in thinking. The mind control mechanism unleashed by the colonial masters on all their former colonies after so-called independence. A conditioned state of mind whereby a person or society has given up trying to find a solution to a problem because they have tried many times and failed, and have come to believe that such problem cannot be solved. Therefore, the person or society becomes helpless, instead of thinking out of the box to solve the problem or continue to find solution to the problem. Software of the mind. Education and or language. Acquired indoctrination is when you inherit a belief about something you weren’t there when it began, like something your parents made you to believe when you was a little boy or girl, and because of that you no longer question it’s veracity. You just believe it because others believe it. A condition or sickness originating in the somatic cells of the body under the influence of external forces, like sound, smell, touch, light, heat, taste. The opposite is psychogenic, which is a condition or sickness originating from mental state. Each appears to produce the other. Download the ebook FREE in PDF at either of the sites below. The paperback and kindle version is on amazon. If anybody is able to download it on amazon or purchase paperback, I'll appreciate you let me know whether the pages fit well on the paper and or your device. I don't have a kindle device to check it, but I've checked with a kindle App on my Android phone and its ok.
Book: Intellectual slavery, the worst legacy of colonialism.